Jonathan Pollard, freed, contests his fair parole terms. 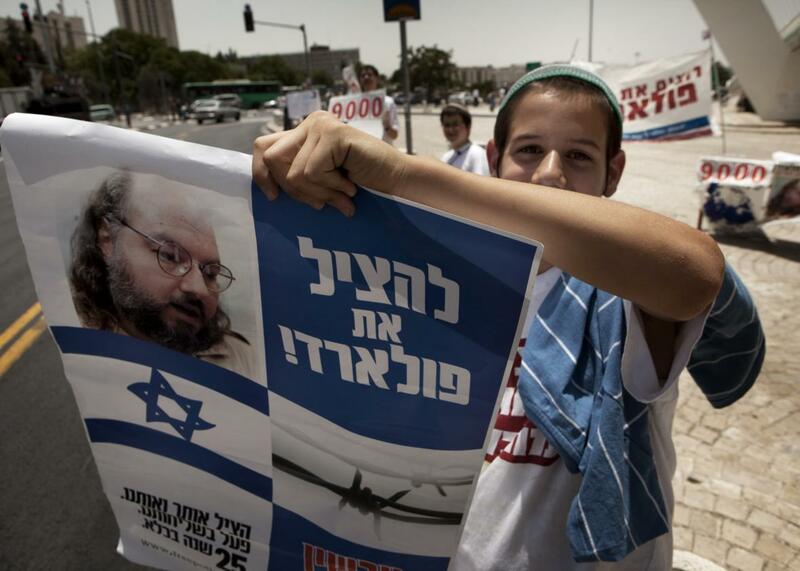 An Israeli youth demonstrator holding a picture of Jonathan Pollard during a demonstration for his release in Jerusalem back in 2010. Jonathan Pollard was released from prison on Friday morning, but the Jonathan Pollard saga is far from over. The former U.S. Naval Intelligence employee, who sold a year’s worth of state secrets to Israel in the 1980s, was released on parole after serving 30 years of a life sentence. As Fred Kaplan documented in Slate this past summer when the then-forthcoming release was made public, Pollard’s spying likely did untold damage to U.S. security near the height of the Cold War. Now that he’s out, his lawyers have already appealed the terms of his parole, which they say include electronic bracelet monitoring and “unfettered monitoring and inspection” of his personal computers or those of any company that hires him. (He already apparently has a finance job in New York, where he and his wife are expected to live.) The Jerusalem Post reported that he will have to check in with his parole officer for a year and could be returned to prison for violating the terms of that parole. He is also not permitted to leave the country for five years, which Haaretz reports could be reduced based on a review hearing in two years, though also possibly extended. Pollard’s lawyers announced that they had filed a lawsuit seeking to overturn the conditions, which they described as “onerous and oppressive” on the basis of the fact that the Justice Department conceded it was “reasonably probable” he would not commit more crimes now that he’s out when they decided not to oppose the release. Their biggest problem is that Pollard will be required to stay in the United States. He received Israeli citizenship ten years into his imprisonment (20 years ago, tomorrow, actually), and there has been a longstanding movement in the country to try to get him freed by pardon and sent to Israel. The U.S. government resisted these calls for an early release for years, deeming his crimes too great and his possible knowledge of U.S. security secrets too much of a threat. Now that he’s out, the Justice Department has continued to take a somewhat hardline stance by requiring that he stay in the U.S. (he is seeking to renounce his American citizenship as part of a move to Israel). Famous criminal lawyer Alan Dershowitz told the Jerusalem Post that the terms were an “abuse of the discretion of parole authorities” and alleged that they were largely politically motivated. The problem with all of these arguments is that the terms of Pollard’s parole are completely reasonable. Pollard should not be considered done with his punishment after serving his “full term.” His full term makes him subject to parole laws and most other ex-convicts have to abide similar terms for crimes not nearly as great. Bill Habern, a Texas parole lawyer and expert in parole law who has worked on probation cases for the State of Israel in multiple states and Canada, told me that a leg monitor and a curfew would be expected in this specific case. “I would anticipate they’re going to keep a tight rein on him,” he said. As for Dershowitz’s claim that the restrictions are politically motivated—well, so what? It is not an uncommon circumstance for international spies to be used as political leverage. In fact, the main precedent Pollard’s supporters cite to say he should get to go to Israel, a Cuban spy named René González who was allowed to return to Cuba for a visit and ultimately remain there less than two years after his release, was actually likely allowed to go to Cuba for political reasons. Federal prosecutors told the judge in that case that “the F.B.I. has concluded that the security interests of the United States are furthered” by González being allowed to renounce his U.S. citizenship and remain in Cuba. “Some experts said the decision could pave the way for a new round of conversations between Cuba and the United States about the case of Alan Gross, an American contractor who has been held in Cuba since 2009 for bringing illegal telecommunications equipment to the island,” the New York Times noted in 2013 at the time of González’s move to Cuba. Gross has since been returned home as part of a prisoner exchange after last year’s announcement of a historic thaw in relations between the two countries.